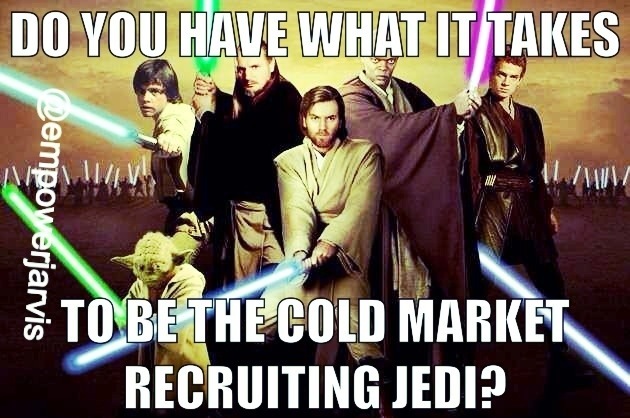 If you were the Jedi of Cold Market Recruiting, Would 2014 be the next dimension for your business and legacy ? First I’d like to mention a few obvious differences and advantages of the cold market. In The Cold market, you’ll never run out of people to talk to and the people you talk to don’t know your history or current results. Here are some basicFundamentals you will need to know know about the cold market. 2) “They want to work with someone who is sharp”. 7) “You should never, tell it like it is. If you tell it like it is,You keep it like it is”. Script #1 “I have to jump on this (team call/run to a meeting) but just curious,would you be open to a side project if it didn’t interfere with what you’re currently doing? Script #2 this script would work best if you’re calling your Cold Market: quick Tip: when the person answers the phone, try to match their tone. If they answer the phone with a high Energy tone, you should match their tone with a High Energy Tonality. If they sound tired, sound tired as well. This is called “Mirroring”. This is “WorkFromHomePro”, calling from my Internet traffic system,how are you today? “Chris, I have to run to a meeting,but just curious would you be open to a side project if it didn’t interfere with what you’re currently doing ? I REALLY Hope you got value from this, like share or comment if you got value. I would like to start by saying THANK YOU, the info you provide is soooo helpful in building my business on a daily basis.I always suggest my business partners to use the SCRIPTS you provide and to study your FUNDAMENTALS.Thank you and GOD BLESS!